NEW BRITAIN - When New Britain took the floor against the Connecticut Heat on Saturday afternoon in the Nutmeg Games 11th grade girls basketball tournament, the coach on the sidelines was a familiar face - Inanna Rice. 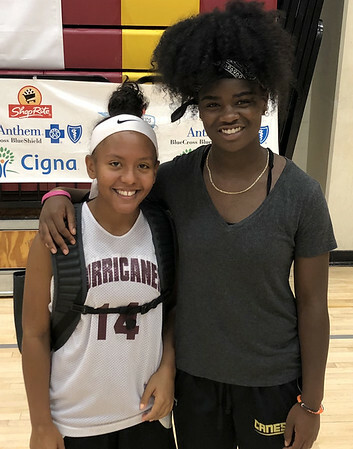 The Mitchell College bound player and former Hurricanes was back on the sidelines coaching up some of the girls she played with over the past year. Running the point for New Britain was an incoming junior Saniya Pellegrini, who’s just one of the New Britain players who has looked up to Rice. With the summer to help out her former teammates Rice is doing everything she can to take advantage of it. In Saturday’s game, Pellegrini wasn’t flashy and didn’t score the ball often with four points in the loss but she set her teammates up throughout the game. Being a floor general for the Hurricanes this season is something Pellegrini is looking to accomplish. New Britain is coming off a 5-15 season this past winter and Pellegrini will hope to be part of the turnaround this year. Posted in The Bristol Press, General Sports on Saturday, 4 August 2018 22:13. Updated: Saturday, 4 August 2018 22:16.